Personalised videos really grab the attention of your audience and shows people you care. Personalised email campaigns and the norm but personalised videos are still relatively uncommon. This makes a personalised video campaign even more impactful to your clients. We can also do really clever stuff such as automate a phone call while your video is being watched or access the recipients facebook and linkedin pictures and incorporate them into their personalised video. 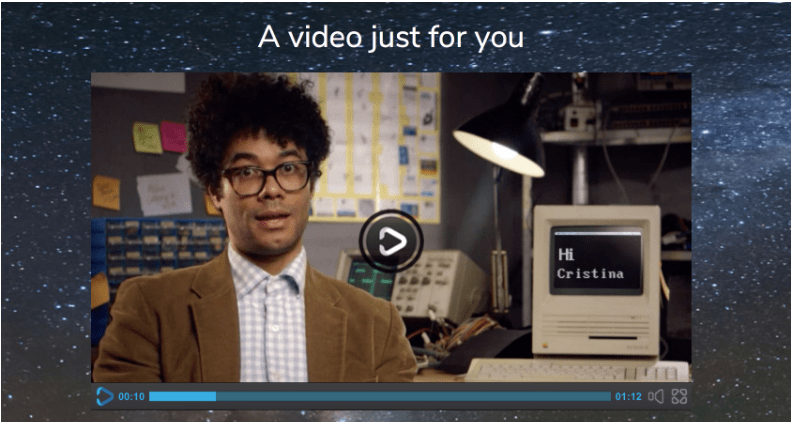 Sprat produced a personalised invitation video starring Richard Ayoade, star of the British sitcom, IT Crowd and Gadget man. Richard is an actor that resonated with the Cisco customer base. We emailed the video to some Cisco customers and the email was a big hit. The video campaign had a 16% overall conversion rate, and a 60% conversion rate for those who viewed the video. These rates are unheard of at Cisco. By giving us your details you agree to sign up to our mailing list and receive occasional newsletters.